Last week BMW Motorsport unviled the M4 DTM Race car. This week, Audi unveiled a beautiful naked carbon fiber version of the new RS5 DTM race car at the Geneva motor show. The car features a revised more aggressive aerodynamic package as well as a modified suspension. It will make its racing debut on May 4th. More details can be found in the press release after the jump. 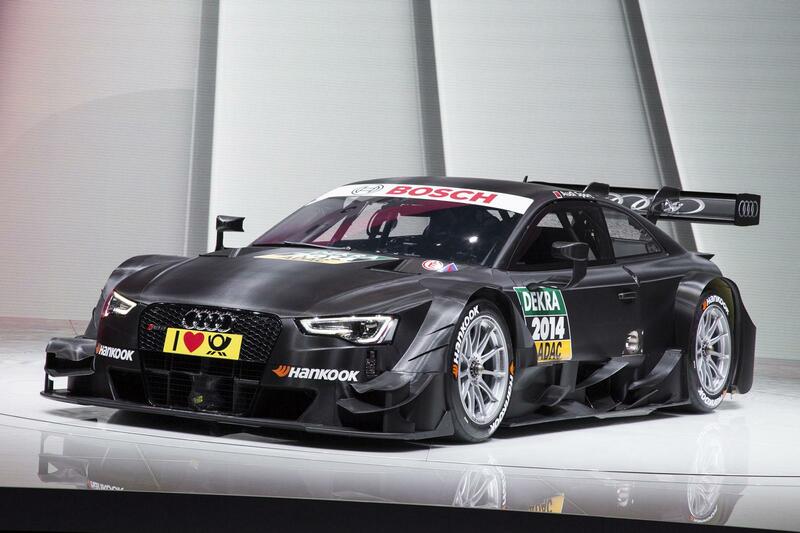 Audi has unveiled the new generation of the DTM Championship winning car at the Geneva Motor Show. The 2014-specification Audi RS 5 DTM with its aerodynamics package having been redesigned in practically all areas looks clearly more aggressive and features visual details bearing an even closer resemblance to the sporty production models of the RS line than its predecessor. The task that confronted Audi Sport after the 2013 season was a real challenge: how do you make a DTM championship winning car even better? Since the strict regulations in the touring car series allow little room for maneuver, the engineers concentrated extensively on detail work. The latest result was unveiled to the public for the first time at the Geneva Motor Show. Noticeable at first glance: the new Audi RS 5 DTM appears significantly more aggressive. The reason for this is the near complete re-development of the aerodynamics. “In addition to the suspension, our main priority was to improve the aero,” says Stefan Aicher, Head of Vehicle Design at Audi Sport. The RS 5 now has the honeycomb grill from the production car at the front and new air ducts feeding the engine and brakes. As a result, the race car now shares an almost identical look to the sporting RS production models. Invisible from the outside, but crucial for the perfect set-up at each respective race track: the work invested under the carbon fiber skin enveloping the RS 5 DTM. “For example, we made suspension modifications to the front and rear axles, from which we expect improvements,” says Aicher, without wishing to go into too much detail about these and other new and further developments invisible from the outside. There are still two official tests in Budapest and at the Hockenheimring on the agenda before Mike Rockenfeller, with start number ‘1’, and his team-mates start the new season at Hockenheim on May, 4.